"The current study indicates that adolescent consumption of energy drinks/shots is widespread and that energy drink users also report heightened risk for substance use," lead researcher Dr. Yvonne M. Terry-McElrath, from the Institute of Social Researcher at the University of Michigan, Ann Arbor, said in a statement. "Caffeine and other stimulant substances contained in energy drinks have no place in the diet of children and adolescents." Terry-McElrath and her colleagues from the university gathered their data through a national representative data that included 22,000 eighth, tenth, and twelfth grade students enrolled in a U.S. secondary school. Researchers marked any association between beverage consumption and each participant’s use of alcohol, cigarettes, or drugs while adjusting for any other lifestyle factors that could play a role in substance abuse. Teenagers who admitted to using energy drinks for a boost of energy, concentration, or alertness were two to three times more likely to report the use of alcohol, cigarettes, or drugs compared with those who did not consume energy drinks. Approximately 30 percent of the teens surveyed in this study reported energy drink consumption. Participants who were more likely to use energy drinks included boys, teens with one or no parents at home, teens with uneducated parents, and, to the surprise of the Terry-McElrath, eighth graders. The research team was also interested in how consuming sugary soft drinks can affect a teenager’s likelihood to abuse alcohol, cigarettes, or drugs. Just over 40 percent of teens participating in this study said they drank regular soft drinks while 20 percent admitted to drinking diet soft drinks. Teens who consumed soft drinks were at risk for substance abuse, but not to the extent of those who admitted to using energy drinks. "Education for parents and prevention efforts among adolescents should include education on the masking effects of caffeine in energy drinks on alcohol — and other substance-related impairments, and recognition that some groups (such as high sensation–seeking youth) may be particularly likely to consume energy drinks and to be substance users," Terry-McElrath added. A similar study that was recently funded by the National Institute on Alcohol Abuse and Alcoholism (NIAAA) recognized mixing energy drinks with alcohol as significant public health concern. 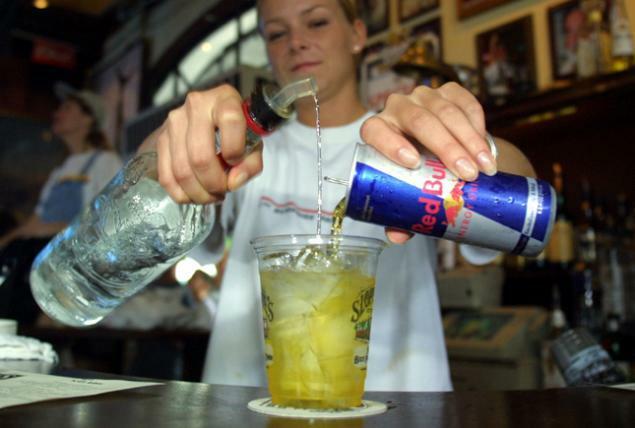 People who mix their booze with energy drinks to create a dangerous concoction of caffeine, sugar, and alcohol have a better chance of suffering from alcohol-related health complications and are more likely to increase their overall use of alcohol. Source: O’Malley P, Johnston L, Terry-McElrath Y. Energy Drinks, Soft Drinks, and Substance Use Among United States Secondary School Students. Journal of Addiction Medicine. 2014.